The owners and operators of Classic Photo Booth, LLC. have over 20 years of experience in the photo booth industry. They happily provide service all over the east and west coasts. The service we provide in New Jersey, New York, Philadelphia, Manhattan, Brooklyn, Connecticut, Los Angeles. We provide nationwide service for multiple events or multiple days. Also we have a stellar reputation and invite you to take a look at our reviews on wedding wire and Yelp as well as some of our testimonials. So far we pride ourselves on making the photo booth renting experience a happy and easy one for everyone! We follow a very hands on approach to our rentals to ensure that your special day goes smoothly and your photo booth rental is the highlight of your event. We are one of the last remaining companies in the country who still works with the authentic vintage (classic) booths. Furthermore we have been providing these equipment on-site for special events since 1995. Our trained technicians are literate when it comes to these machines from start to finish. From the execution of the delivery to your experience during the event, we guarantee your satisfaction. See more of what our clients have had to say about their experience with classic photo booth on our testimonials page. 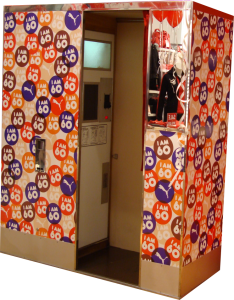 We have experience and knowledge to create photo booths of every shape, size and composition. We know what we are talking about. Over the past few years, many companies have popped up claiming they provide photo booth rentals. Most of these are merely entrepreneurs seeing an opportunity to sell a service they may not know much about. We see shoddy photo booth rentals all the time with other companies. So the best advice we can give to any potential customer is to read the contracts thoroughly. Also look into how long these companies have been around. Therefore the more educated you are – the better decision you will be able to make. In addition if you need our professional opinion, we’ll gladly help you, even if you are not going to use our services. With over 20 years of experience, Classic Photo Booth puts our clients first and make sure that we exceed all of their expectations. We rock corporate events and have worked with hundreds of Fortune 500 companies such as NBC and COACH. Our photo booths technicians make sure your event goes flawlessly. Let us entertain at your event and you will be amazed! We turn a good event into an extraordinary and unforgettable event with classic photo booth! Our expertise will bring fun to your party and revenue to your event, attracting all types of people. Each of our technicians and attendants are fully trained and provides enthusiastic and friendly guidance. 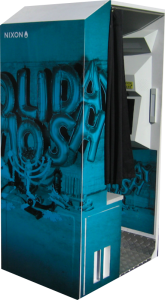 We provide a classic non digital photo booth for wedding, bat/bar mitzvah, corporate events, celebrities, sweet sixteen. 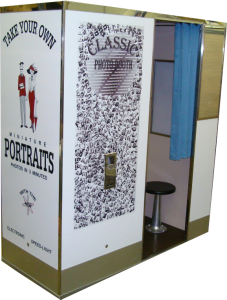 Classic Photo Booth is the premier provider of photo booth and entertainment rentals across the United States. Photo booth rental is the trendy new standard at weddings and other events. Great for affordable wedding pictures, a photo booth is sure to entertain your guests. Choose from our wide variety of classic and digital photo booths as well as green screen photo booth. In addition to our photo booth we also supply fun, new and trendy party rentals. If you are set on photo favors but a photo booth is not for you, be sure to check out our other photography packages. Also we have Open air Photo Booth with red carpet or Green Screen Photography. Our video, arcade and casino rentals are sure to liven up any party too! We have something for everyone and every event. Also we have the capabilities of providing photo equipment for festivals including Photo Booths, Moving Camera-Men (with photo editing). Open Air Photo Booths, Red Carpet Photo Stations, Novelty cards, Flip book station and more you can rented from Classic Photo Booth LLC. We are the most creative company on the market today – if you envision something for your event, we can make it happen. Plus, our years of experience in the photography industry have provided us with much knowledge on every type of entertainment rental. Our experience will surely show in the execution of our events, as all events are executed professionally and we strive to create happy customers who come back to us for all of their entertainment rentals needs! Customization of Classic Photo Booth or EVERYTHING for wedding! That’s right! We offer many different options to make the photo booth your own! From weddings to corporate events we can customize almost EVERYTHING! We can make your photo booth pop with wedding monograms, corporate designs and brand logos. Our customization logos and backgrounds on photo strips are an even better way not to forget there experience. We can even help you make it seem as if your guests or clients are taking photos at exotic destinations or in front of inventive backgrounds. We devote our selves to our clients! We want to make sure you get the most out of your event and go well above and beyond any expectations. Our photo booths and equipment are always checked and maintained so that it gives the best results at your event. You always get a top of the line product and production every time. Never worry about losing your photos. We provide scrapbooks and even online photo galleries! No event is ever the same. We can customize our booths to your liking so that you can add your own unique and personal touch, anything is possible! Don’t let knock off photo booths and photographers take advantage of you! We have the real deal! Rachael Ray is certainly a reliable source for all things cooking, but now she can also be considered a reliable source for who to contact for photo booth customization! Prior to the start of the newest season of the Rachael Ray Show, she moved her talk show studio to a new venue and revamped the entire set! She decided to incorporate a photo booth into her new studio where she could take photos with her talk show guests. Rachael’s photo booth needed a full exterior photo booth customization to fit the theme of her new location so she came to Classic Photo Booth, LLC!